I love me some Rick Riordan! Ever since I picked up the first Percy Jackson book on a whim, I'm excited to read anything this man puts out. Sometimes it doesn't quite work for me (Kane Chronicles), but most of the time I've got nothing but love. Apollo's voice is quite different from Percy's or any demigods, and I applaud Rick Riordan for being able to write it consistently so. I think at one point my status update was "I can't with Apollo!" because maaan is this god-turned-human arrogant. But if you think about it -- he's a god, so the big head makes sense. 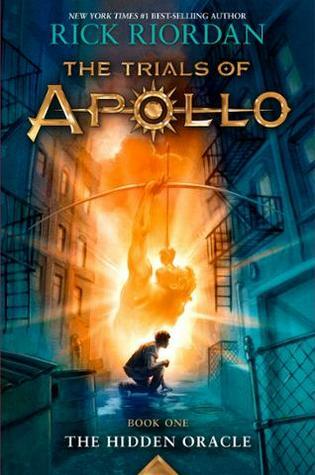 But the beauty in this book was Apollo's character growth. Is he still arrogant at the end of the book? Yep. But he has also picked up some of the best traits of humans: dedication, perseverance, love, loyalty. The story dragged for me a little bit in the middle, but I think this was because of the combination of two factors: 1) it's the first in a series, so a lot of explanation needed to happen; and 2) I was listening to the audiobook, and that sometimes makes books seem slower. I loved seeing some of my favorite demigods from Riordan books past. There was also QUITE a plot twist that I did not see coming!! I'm looking forward to seeing how Apollo reacts to things in the next part of his trials.